When looking for the best marijuana schools there is much to take into consideration before making your decision on which one to invest your time and money into. The best marijuana schools are the ones that give the most useful information and for the best price. Some marijuana schools are very expensive and do not give a great cannabis industry education. 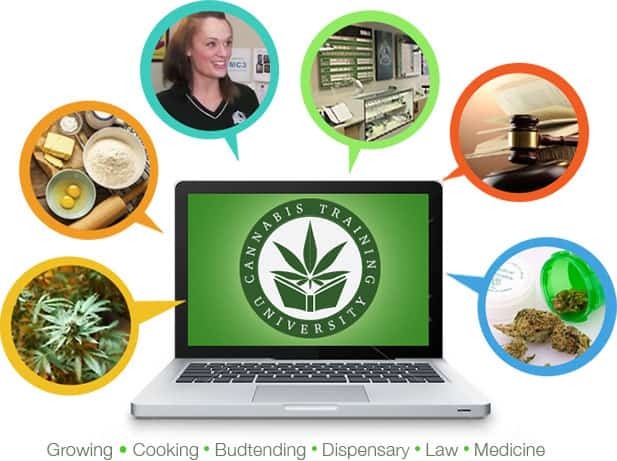 -Cannabis Training University is a fraction of the cost of all other cannabis schools. CTU gives an entire year of access to all of its students and for one low price. Students at CTU do not have to pay every month for their access time and can come back unlimited times without worrying about getting hit with a steep monthly subscription. Cannabis Training University is the most affordable cannabis college. Other online marijuana schools charge as much as $50 per month, every single month, over and over adding up to around $500 for cheap watered down powerpoint slide shows that they invested no money into producing. Do not be fooled by online marijuana schools that give free trials then try to get you to pay $50 every month and take $500 out of your pocket by the time you get your year of access. CTU is the only online cannabis college that has the students best interest in mind and keeps pricing affordable so people of all income levels can enjoy the education. When looking for the best marijuana school it is important to remember that you deserve a lot of time to be able to access your content that you pay for, without having to worry about getting hit with a $50 charge or more every single month! And you deserve a cannabis school that invests in its program and thinks of how important it is to put together the best quality cannabis program there is! If you are searching for the best marijuana school you have come to the right place. CTU is the premier cannabis education and gives more for less! Start your cannabis career today with the most affordable online marijuana school.